The dog days of summer may have passed (we hope) but the heat is on, with just over two weeks of school left and symposium projects galore. 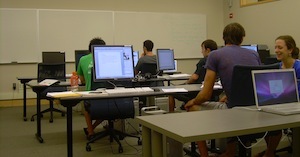 Cubicles in the library are filled to capacity, and the Wilson Media Lab is no exception. With a full fleet of tutors, we are working hard to meet the digital media needs of students, staff, and faculty. Here’s just a taste of what we’re working on. In addition to our long-term projects, the lab is busy every day with walk-ins making projects for classes, presentations, or research. In other lab news, we’ll soon be updating the software image on the Mac towers, which will include an operating system upgrade, among other things. With each passing year, we hope to keep the lab up-to-date on technological/educational developments and continue to support the Middlebury community’s forays into the latest in electronic possibilities. We’ve also recently installed a new color printer, so please be aware that students seeking color printing can be directed to us whenever the need arises. We’re always happy to help them, and anyone else, with media-related questions. This entry was posted in LIS Staff Interest and tagged Davis Family Library, Digital Media Tutors, Enterprise Applications, Middlebury, Wilson Media Lab on July 29, 2010 by Joseph Antonioli. yeah for the color printer!